When I look through décor magazines, one thing that I continually notice is the use of texture and prints. Simplicity looks chic when paired with layers of details. Pillows, curtains, rugs, accessories. They all add to the feeling of the room. One of my favorite ways to add interest with layers is through a lampshade. Gone are the days of the plain white lampshade. Now professional and amateur decorators are finding fun ways to dress up those shades. Look around your house. Got any plain or bare lampshades? If so, here are three easy ways to transform them without spending a lot. First, think about the room. If it’s a child’s room, you can use follow the décor theme or add some of their favorite objects to dress up their lamp. My youngest daughter’s room is shabby chic. Her bedding is a mixture of white, pinks, and blues. 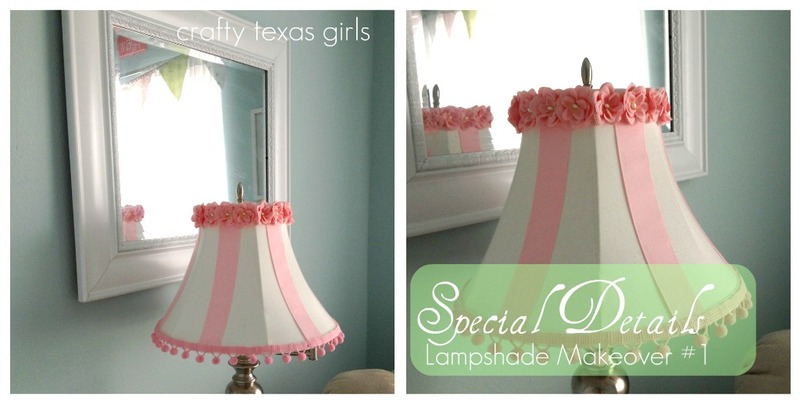 Since her walls are also blue, I wanted to make her lampshade super feminine with some pink accents. I used silk flowers from a craft store along with grosgrain ribbon and pom-pom trim. The lamp, which is just from Target, is now a custom piece of décor thanks to the little details. Second, shop your hardware department. For months I drooled over the sea grass lampshades in my favorite catalogs. But since I already had perfectly good lampshades it seemed a waste to buy new ones. Instead I used sisal rope from the ‘home improvement’ aisle at Wal-Mart. For under $15 I bought two spools of the rope and used hot glue to attach it to the pre-existing lampshade. I think the natural texture of the rope was just what my lampshade needed. Finally, break out the sewing machine. Do you know how to sew a ruffle? If not you are in luck, it’s quite simple. You can add dimension or just simply cover up an ugly shade with rows and rows of ruffles. I wanted to get rid of the red in our bedroom, but my budget was pretty much spent. I began by covering up the red fabric with muslin. Next, I cut 2.5-inch strips of muslin and ran a straight stitch down the center, making sure to adjust the stitch length and width to the highest setting. When I was done I carefully tugged on one thread and the fabric ruffled right up. 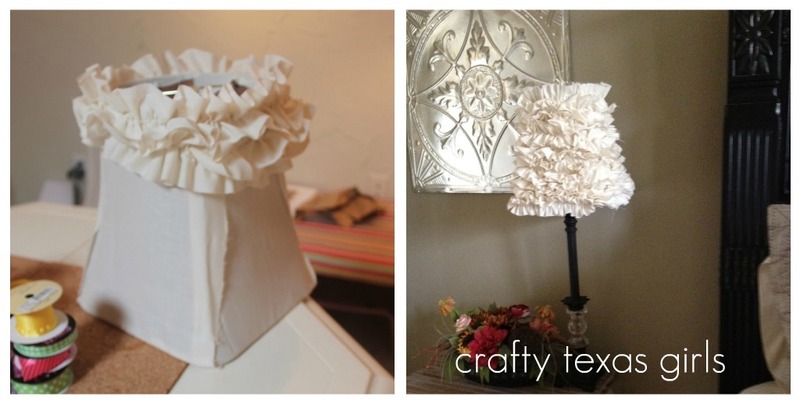 I continued to make ruffles and then hot glued in rows to them my lampshade. My new-ruffled lampshade is now my favorite part of the room. One small change can make a room feel fresh. Have you brightened up your home with a lampshade transformation? *Don't forget to enter my Rubee Lane Giveaway for a chance to win a basket full of boutique goodies. **Cowgirl Up! goes live tonight- come stop by to post your latest project or find inspiration for your home. 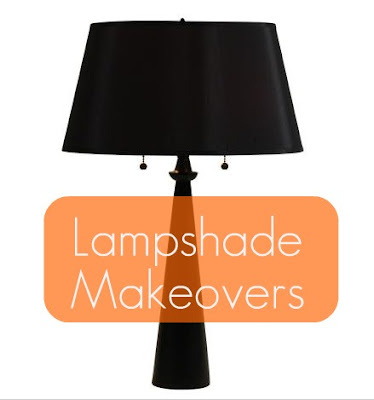 I have a book all about creative lampshade makeovers, but these are prettier! Too bad the best one involves sewing... I have got to get over the fear and nerves and just learn my new (to me) machine! Love them all! I have a boring lampshade that needs a makeover! Wow, you are one crafty girl!! 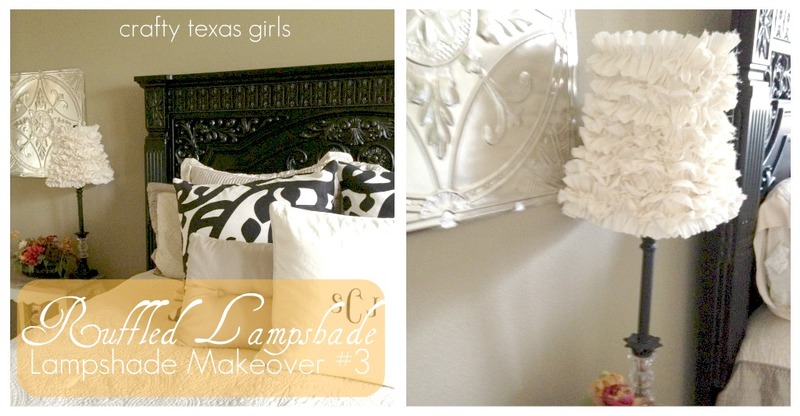 Love the last lamp the most, but that pink one sure would be perfect in my daughter's pink room.